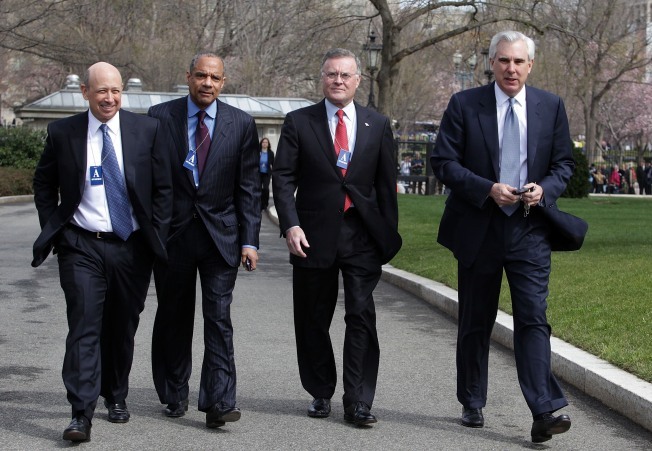 (L) Lloyd Craig Blankfein, CEO of The Goldman Sachs Group, Inc, Kenneth Irvine Chenault, CEO and Chairman of American Express, Kenneth D. Lewis, Chairman, CEO, and President of Bank of America and Edward Yingling, president of the American Bankers Association, walk down the driveway at the White House on March 27, 2009 in Washington DC. Top company bosses saw their pay decline further in 2009, the first time in two decades that it has fallen for two consecutive years, according to a new analysis. The Hay Group management consultancy examined the salaries, bonuses, stock and long-term incentives of the chief executives of 200 major U.S. companies. The firm found that the median value fell by 0.9 percent last year to $6.95 million, the Wall Street Journal reported. In 2008, pay fell by 3.4 percent. However, the highest-paid executive in the survey, Ray R. Irani, CEO of Occidental Petroleum Corp, still made $52.2 million, the Journal reported, noting the company's stock rose by 36 percent last year. Charles Ergen, CEO and founder of Dish Network Corp., was the worst affected with his salary falling by 92.5 percent from his 2008 total to $623,000, the Journal said. The analysis was released as it emerged that Obama administration is scrutinizing corporate pay in an attempt to discourage risky business practices. The administration imposed restrictions on executive pay last year at larger companies bailed out by the government. The Treasury Department is not looking to limit the total pay executives receive, The Washington Post reported. But Kenneth R. Feinberg, Obama's special master for compensation, told the Post he wanted to change pay incentives to give executives a greater stake in the long-term performance of their firms. That would mean smaller upfront cash salaries and fewer perks, more compensation in the form of company stock and a longer wait to receive it, according to the Post. However, some analysists said businesses are finding ways to lower the top headline pay, while still keeping chief executives happy. "I see no indication whatsoever that the business community is paying any attention to the administration's suggestions," Nell Minow, co-founder of the Corporate Library, an independent corporate governance research firm, told the Post. American Express moved much of Chief Executive Kenneth I. Chenault's compensation into cash, the Post reported. So while his overall pay for 2009 dropped from the year before, Chenault received $11 million, or two-thirds of it, in cash, according to the newspaper. In 2008, more than two-thirds of his compensation was in stock and stock options and his cash payout was $7 million. Wells Fargo more than tripled the cash salary this year of Chief Executive John Stumpf, the Post said. Corning, a glass and ceramics maker, restructured its long-term incentive pay program, which was previously centered on stocks and stock options, to focus more heavily on cash. "As firms begin to disclose last year's bonuses ahead of annual shareholder meetings, it is becoming clear that companies across a wide range of industries are paying executives in ways that [administration] officials worry will not discourage the kind of excessive short-term risk-taking that led to the financial crisis," the Post said. The Wall Street Journal reported that the Hay Group analysis showed that highly paid chief executives "generally run companies that deliver better-than-average shareholder returns." The analysis for the Journal bore out the picture of chief executive receiving more in upfront pay. While long-term incentives — mostly stocks and stock options, fell 4.6 percent to a median of $5 million, salaries and bonuses rose 3.2 percent to $2.64 million. Median means half of CEOs made more than these figures and half made less. In late 2008 as the recession started to deepen "many boards lowered targets for 2009 — and so some CEOs collected bonuses even as profits declined,'' Irv Becker, head of Hay's U.S. executive-compensation practice, told the Journal. The newspaper reported that pay curbs appeared to be ending with several companies canceling cuts or thawing salaries that had been frozen. In February, Pfizer Inc. ended a pay freeze affecting Chief Executive Jeffrey Kindler, increasing his pay to from $1.6 million to $1.8 million. Despite concerns about a return to risk-encouraging pay structures, Feinberg told the Post there were "small, early signs" that at some companies were getting the message. He cited Goldman Sachs Chief Executive Lloyd Blankfein, who took all of his bonus in restricted stock that cannot be sold for five years, as an example. "I think Wall Street and other companies would be well advised to follow the prescriptions I've laid out," Feinberg said.